Nic, you really should be used to all the screaming right now. Don't be scared! Nic, you really should be used to all the screaming right now. Don’t be scared! Director Joel Schumacher joined Nicolas Cage on the red carpet for the gala screening of Trespass. Safely inside, Nic finally began to relax. Québécois actor Patrick Huard stars in Starbuck, which also had its gala last night. Starbuck is a sperm donation comedy, in which Huard plays a 42 year old man who discovers he has fathered more than 500 kids. At least we know Huard's wife, musician Anik Jean must be one of them. Starbuck is a sperm donation comedy, in which Huard plays a 42 year old man who discovers he has fathered more than 500 kids. At least we know Huard’s wife, musician Anik Jean must be one of them. This photographer is clearly a pro. No problem with camera angles here. The umbrellas came out last night when rain threatened to dampen the red carpet for Joel Schumacher’s Trespass. 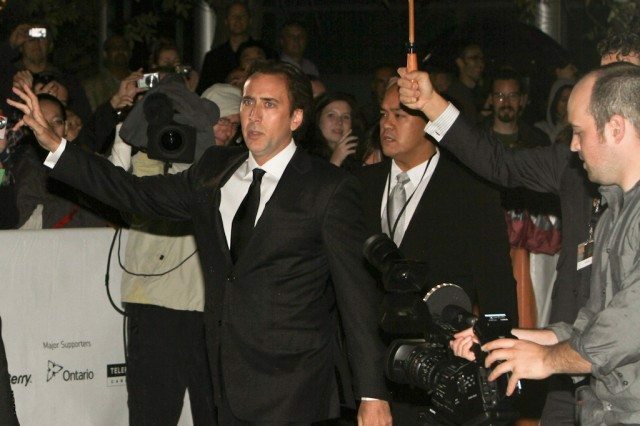 For the most part the rain thankfully held off, allowing hordes of fans to scream their heads off about Nicolas Cage. Cage was cordial and signed lots of autographs, though he did look a bit terrified at times. (Possibly that’s because he read our review of the film: we gave it one star.) Also, there was a very clever guy on stilts.